My husband and I just got back from a trip to Hawaii. Since we only had 6 days, we decided to stay in O’ahu for the entire length of our trip. 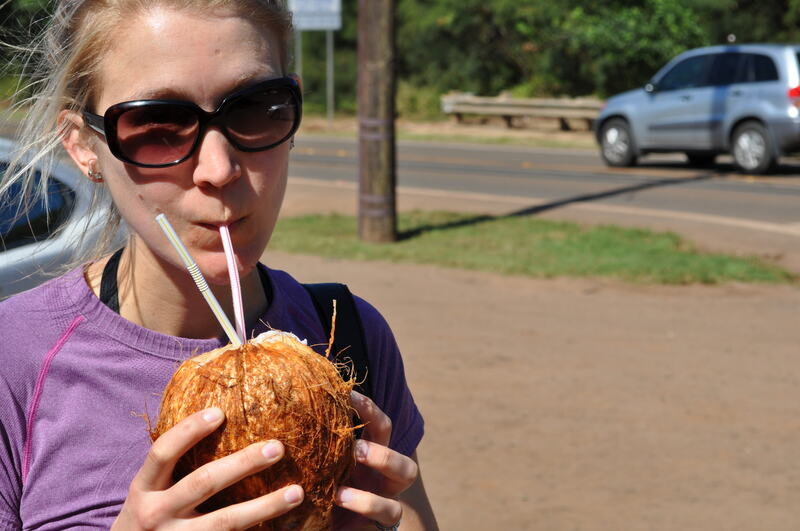 We had the opportunity to explore many of the flavors and sights of the island. 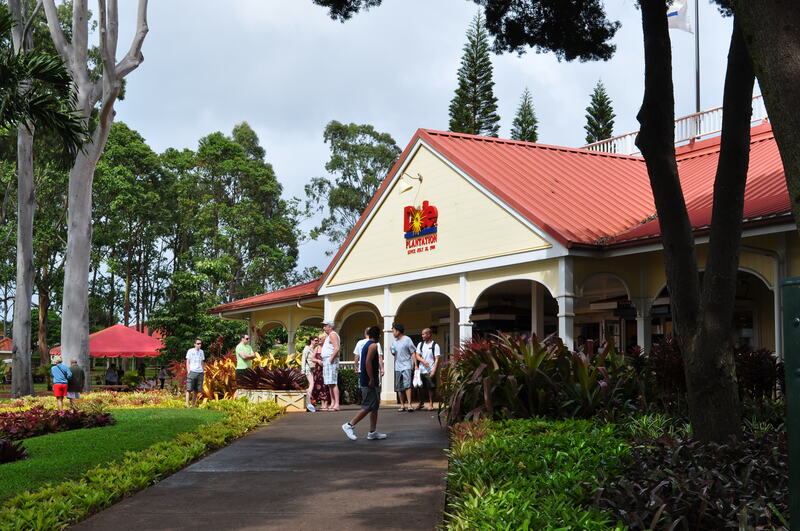 We stayed on the North Shore of the island in the town of Waialua with my husband’s brother and his fiancee and traveled throughout. 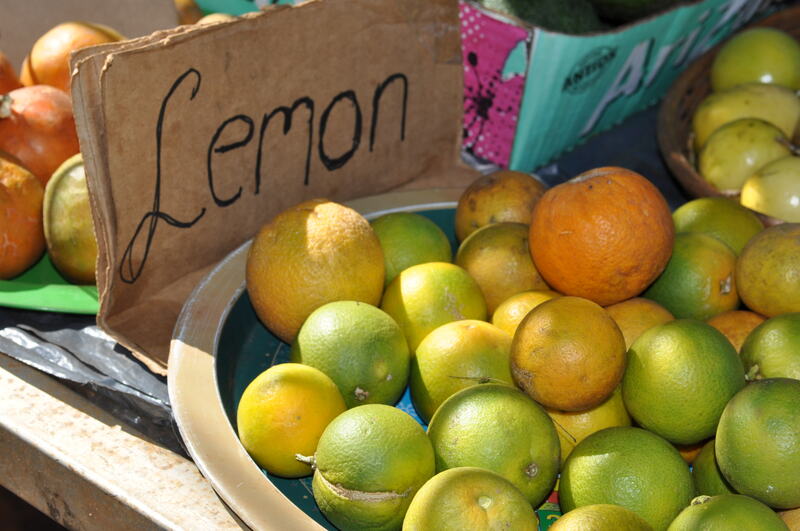 As a food systems planner, I was quite interested in the local food system and sustainability policies of the island. 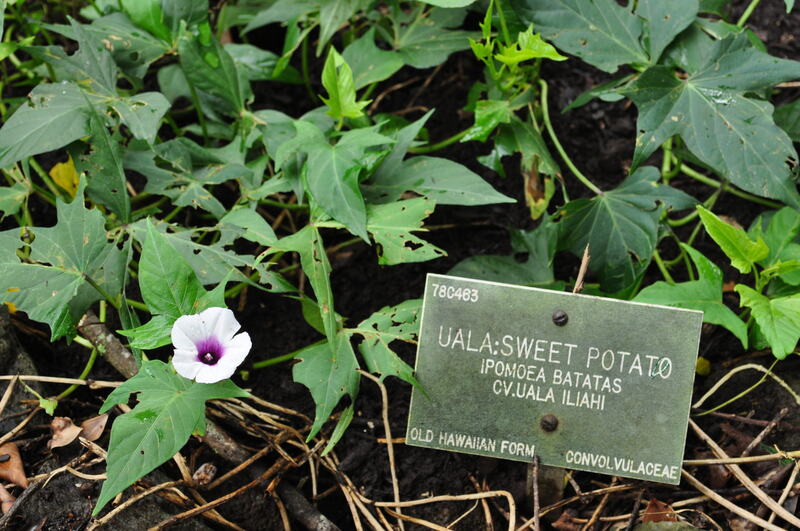 Both Slow Food O’ahu and LEAF HAWAII: Solving hunger and poverty one farm at a time provided a nice overview of the local food and sustainability scene and historical context for the social, economic and environmental opportunities and problems Hawaiians face today. Below is a brief overview of our discoveries. 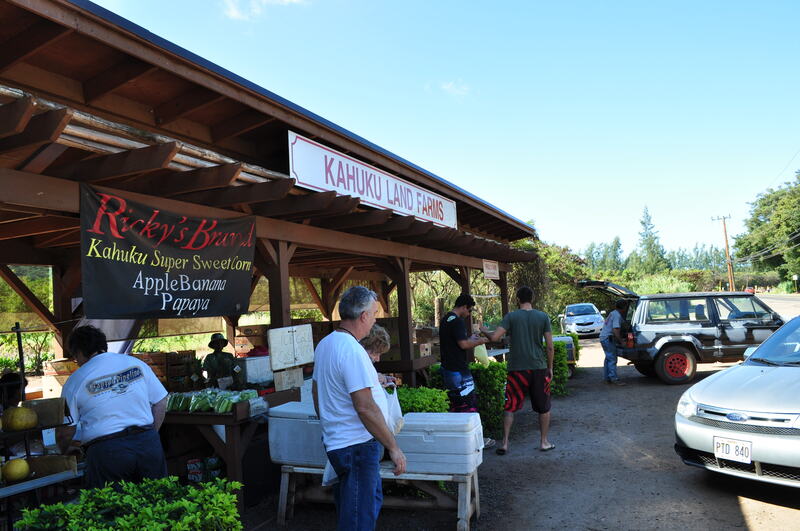 For a map of restaurants recommended by Slow Food O’ahu, click here. 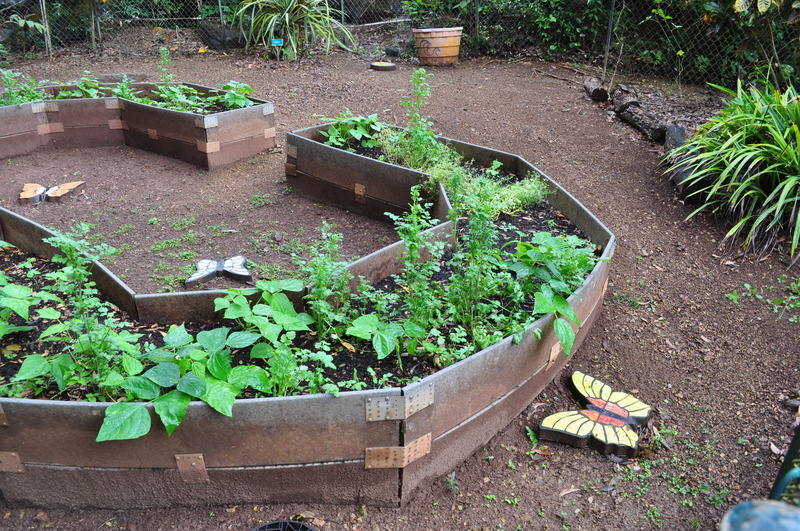 Also, check out Edible Communities Hawaii Islands for additional information about the food system and a list of farmers’ markets in O’ahu. 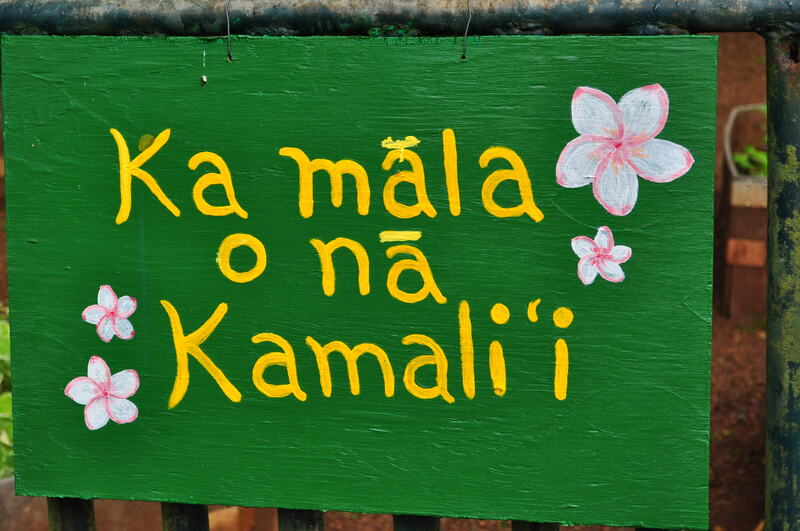 In our visit to Waimea Valley, we learned about pre-contact Hawaii’s land division system. The ancient land division system created wedged-shaped, self-sufficient units of land, called ahupua’a, which extended from the mountains to the sea and therefore provided all the basic necessities: food, shelter, cloth and medicine. 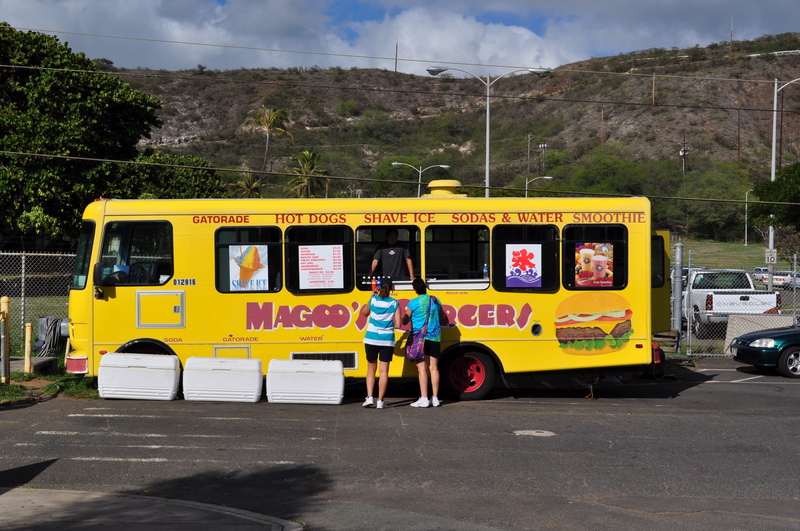 After walking around Waimea Valley, we couldn’t resist getting a snack. 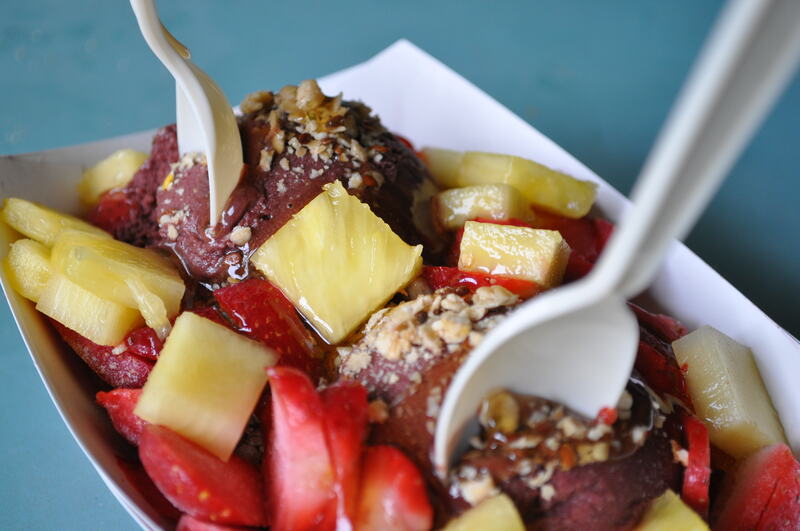 Here’s a picture of our Ono (delicious) Acai Berry Sorbet, topped with ginger granola, strawberries and pineapple. 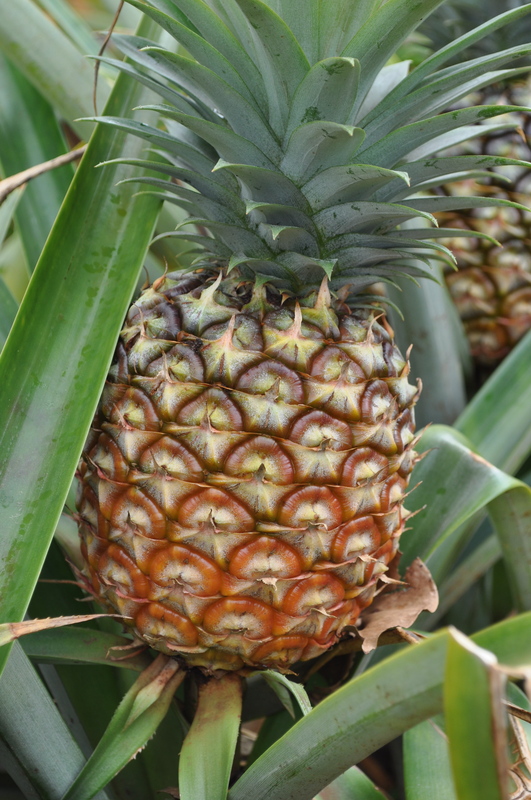 We had no idea how many varieties of pineapples exist. 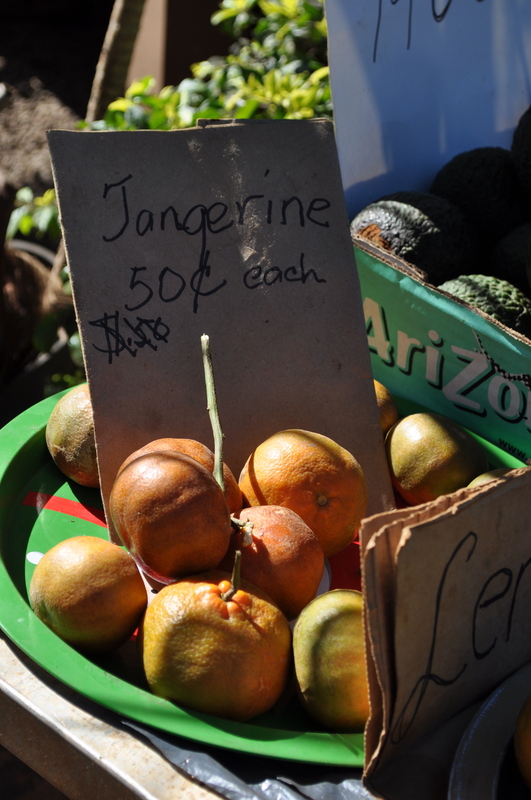 Smooth Cayenne is the predominant variety in Hawaii. 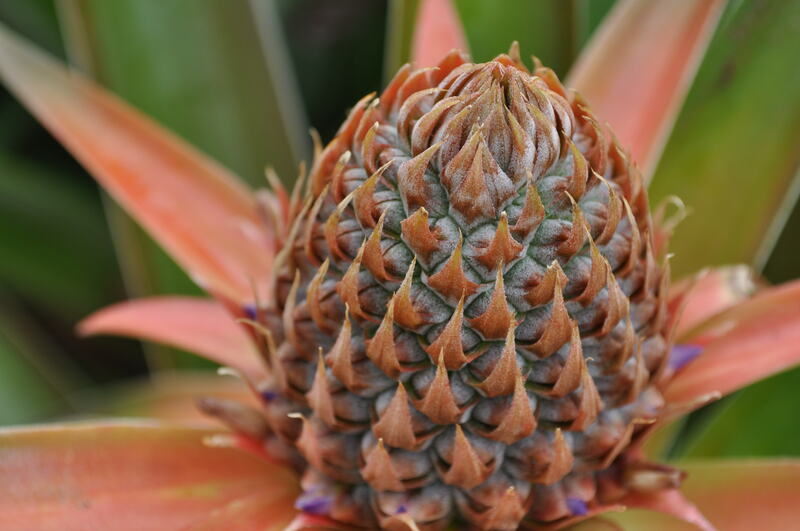 So the next time you buy a Dole Pineapple, that’s a Smooth Cayenne. 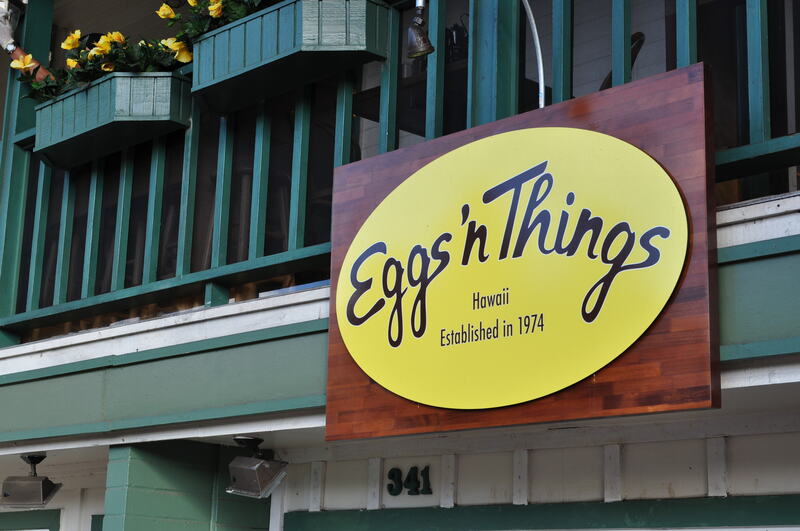 Our friends John and Greg insisted we visit Eggs’n Things, a very popular all-day breakfast place in Waikiki, a neighborhood of Honolulu. We ordered an omelet and Hawaiian pancakes. 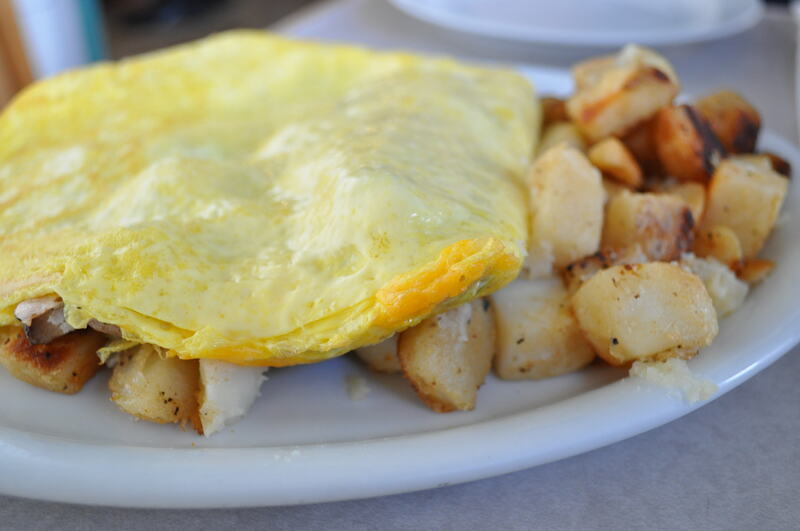 The omelet was good, but nothing special. For anyone thinking about visiting this restaurant, we recommend splitting the Hawaiian pancakes, and forgoing anything else on the menu. 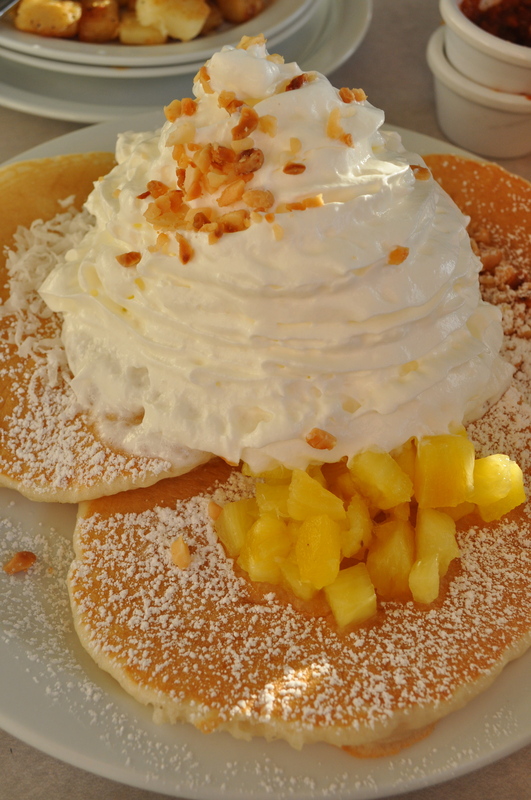 The pancakes were light and fluffy and came topped with chopped pineapple, coconut, macadamia nuts, and whipped cream. This is definitely a sweet dish, but delicious. 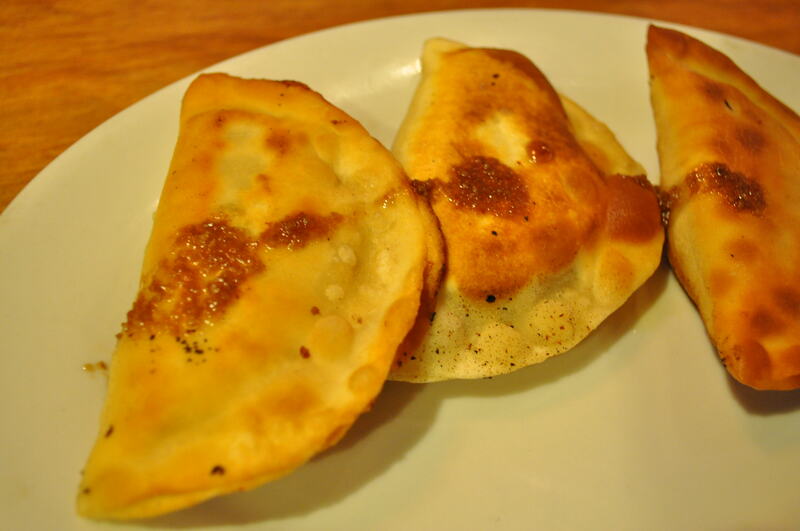 Try it sprinkled with a little coconut syrup. Ono! A trip to Hawaii wouldn’t be complete without a sample of some of the local beers. 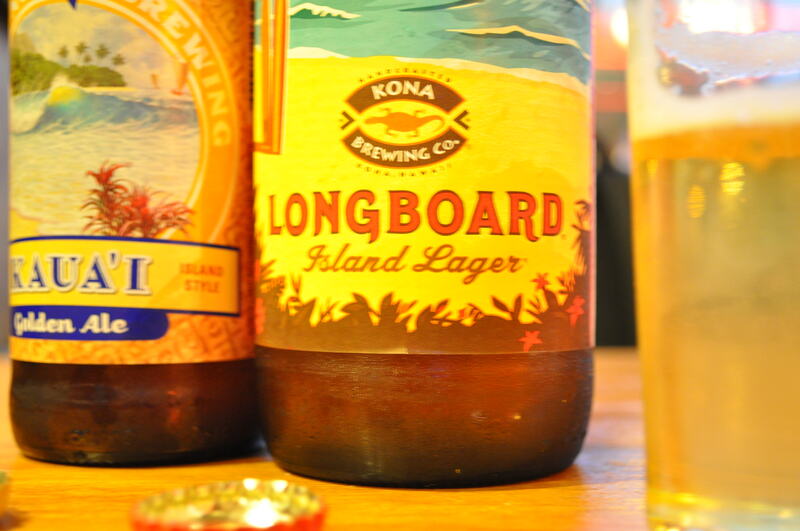 We sampled Kona Fire Island and Longboard, Kaua’i Golden Ale, and Primo Lager. All were quite tasty, but our favorites were Kona Fire Island and Longboard. Rex and I found the cutest BYOB restaurant in Chinatown, Little Village Noodle House. 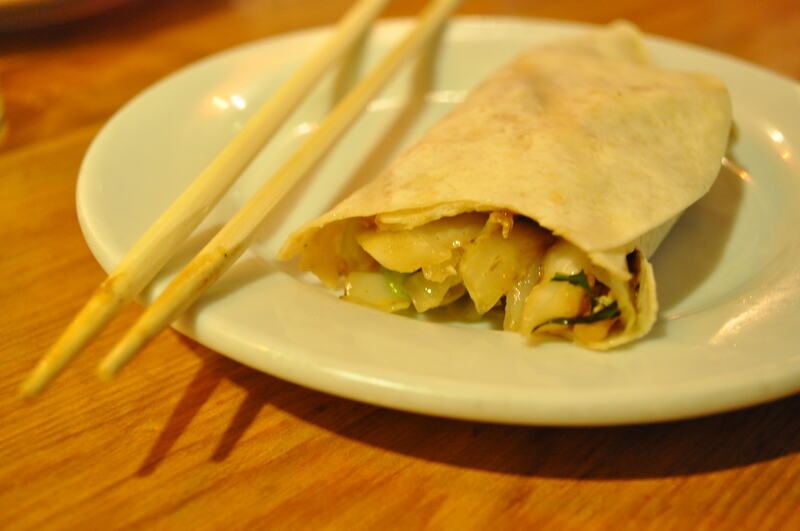 We would recommend the Mu Shu Roll and Panfried Turnover with parsley and turnip filling. 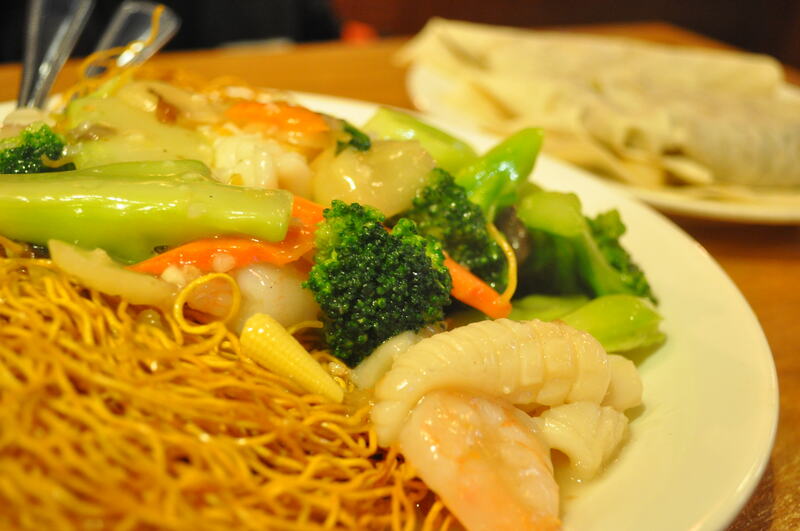 We ordered the Seafood w/ Mixed Vegetable Fried Noodle, but found the dish too salty and had too much cornstarch in it. Haleiwa is a fabulous little surfer town on the North Shore of the island, and home to the only Patagonia in all of Hawaii. 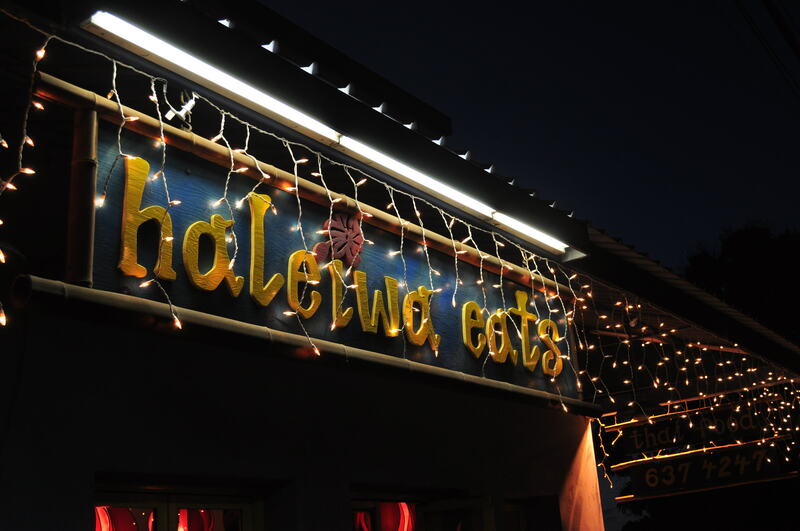 We tried several restaurants in Haleiwa, but our favorites included Haliewa Eats Thai and Banzai Sushi Bar. We recommend the Panang Curry with Tofu and Pineapple Curry with Tofu over brown rice at Haliewa Eats Thai. Both were delicious! We recommend the special Ahi roll with soy paper wrap – yum!